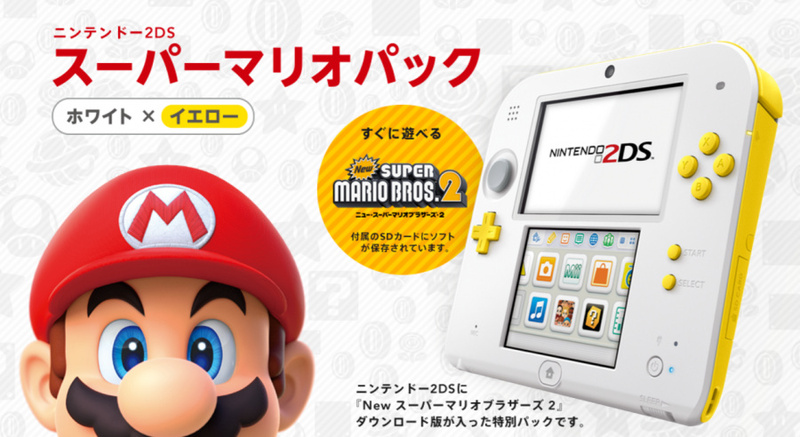 Nintendo has confirmed that Japan is getting a new 2DS model this December. The rather fetching yellow and white model will come with New Super Mario Bros. 2 pre-loaded and will retail for 12,938 Yen. Also included in the bundle are a 4GB SD card, AC adapter and the traditional 6 AR cards. The bundle launches in Japan on December 15th. Let's face it, you can never have too many 2DS consoles. It looks nice. Why does Japan get all the cool colors? Truth be told the 2ds is a fantastic entrylevel into ds gaming. I recently bought.myself a n3ds and wonder how much better it is. What I hope with Switch, assuming it is indeed Region Free, is that some of the more funky designs they get in Japan are available across the globe. The colour scheme in the version used in the reveal trailer is so bland. White and Yellow = Banana ! Japanese has a lot of interesting stuffs like that. Neat, not interested in 2D's, but still that's pretty neat. My favorite New Super Mario Bros. game! That's honestly not saying much, though. @Tempestryke I don't know but, apparently, the only colors we really like here in 'merica are red and blue. Retail price of 12,938 Yen. According to Google, that's $123.56 USD. It's starting to feel like we're REALLY getting a deal here in the U.S. on 2DS at $79.99. this makes me want a 2ds . ..